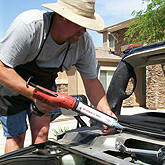 Auto glass repair and replacement for the Phoenix, Scottsdale, Glendale, Mesa, Tempe and more. Full service local auto glass repair and replacement for Prescott, Prescott Valley, and the Verde Valley. Want to replace your windshield? Mobile, on-site windshield replacement done on-time. We do all auto glass! For most vehicles it takes less than 1 hour for removal and replacement, plus curing time. After the repair, most cars are back on the road in about 2 hours! We use a high-quality adhesive which has been formulated for increased torsional stability, for a quiet and smooth ride. Trust your windshield replacement to an industry leader. 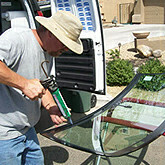 Curbside Auto Glass has been replacing windows in Arizona for over 15 years. That means we know auto glass, and we know Arizona. No one does a better job at windshield replacement than Curbside Auto Glass. We appreciate how busy your schedule is. Curbside will come on-site, with mobile service that can be scheduled in a 3 hour window, so you don't have to sit around all day waiting for your windshield replacement. With Curbside Auto Glass, windshield replacement is easy. Don't be fooled, the law lets you choose your repair company! Some insurance agents make deals with auto glass companies, then try to influence customers so they believe they don't have a choice in auto glass repair companies. Don't be fooled! The law gives you the right to choose your auto glass repair company, so choose the best company in Arizona. Curbside Auto Glass will manage your insurance claim from start to finish faster than anyone.